After a season long dominance in grand prix qualifying, it appeared poised that the Red Bull-Renault could be defeated for the first time during the 2011 Formula 1 campaign. In a first set of runs for the 2011 Japanese Grand Prix, the McLaren-Mercedes cars of Lewis Hamilton and Jenson Button had gained the provisional front row. Ahead of both Red Bull Racing cars of Mark Webber and 2011 Formula 1 championship contender Sebastian Vettel, the McLaren team was determined to present something other than Red Bull Racing colours on a Formula 1 pole position. Not since Williams took pole at the Brazilian Grand Prix has another Formula 1 team car claimed top spot in qualifying. Unwilling to surrender, Red Bull Racing would not allow the McLaren Formula 1 team to gain this pole without a fight. With only seconds left in the Q3 session, Sebastian Vettel crossed the start/finish line securing one final lap in the final 10-minute session. In a show of last minute brilliance, the Red Bull-Renault was guided around the 18 turns of the 5.807 kilometer Suzuka track to a superior final run. Crossing the finish line with a 1 minute, 30.466 second lap time, Sebastian Vettel took pole for the third straight time at the Japanese Grand Prix. Making a final effort, Jenson Button displayed near equal grace as Vettel in the very late stage of Japanese Grand Prix's Q3 session. Driving his McLaren-Mercedes, Button missed the pole position by an alarmingly tight 0.009 seconds. The McLaren team shows up at Suzuka with a rear wing specially designed for the Japan circuit and appears to be on an even playing field with the Red Bull Racing organization. Not withstanding the intensity of the final qualifying runs of Sebastian Vettel and Jenson Button, action on the Suzuka track was actually quite humdrum during the day. Through Friday practice, Formula 1 teams have become increasingly concerned about tire wear of the Pirelli racing slicks on the Japanese track surface. Only six of the ten eligible drivers and cars in the final Q3 session actually recorded runs. Several teams chose to preserve their fresh, allotted tires rather than improve position in qualifying. 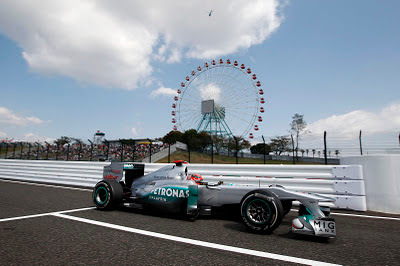 Starting 7th for tommorow's Japanese Grand Prix, Michael Schumacher was the leader of the four-car pack recording no times with a final qualifying run. However, in the case of Schumacher and the Mercedes GP team, the fact a run was not registered in qualifying was blamed on poor planning for the time to release themselves on track. Exiting the track behind Vettel, Button and Webber, Michael Schumacher would not cross the start/finish line before the 10-minute session clock clicked down to zero. 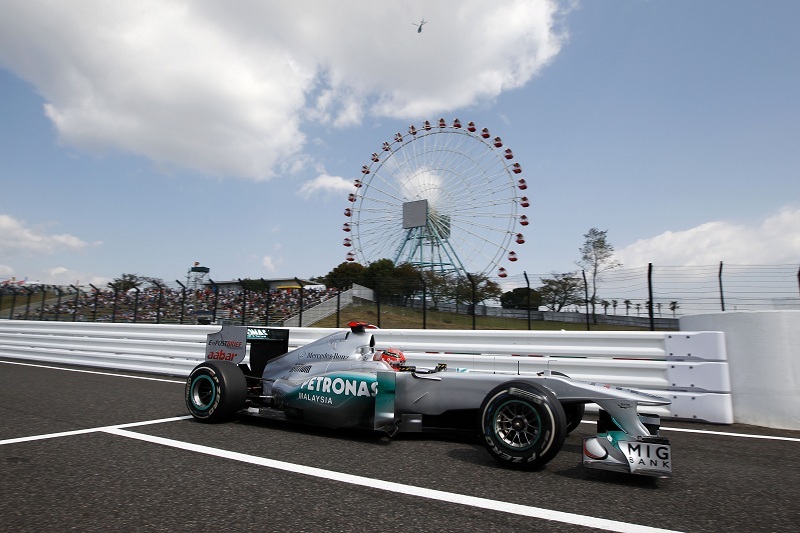 A sluffu for one Mercedes GP car, the second car piloted by Nico Rosberg did not even participate in the Japanese Grand Prix qualifying session to due a hydraulic issue with his car. For this race weekend in Japan, the Suzuka is likely to play host to another championship in a long-running heritage for the circuit. 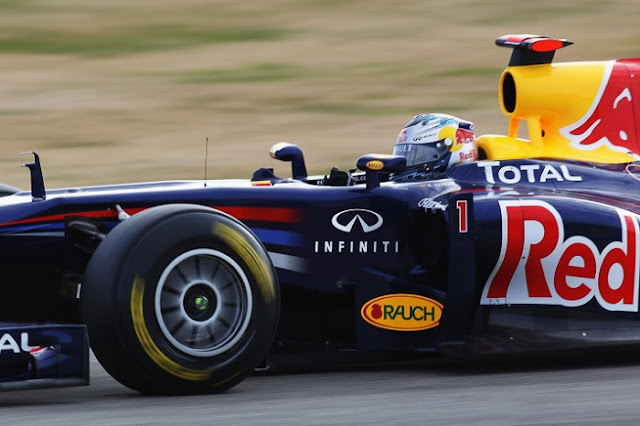 Entering into the Japanese Grand Prix, Sebastian Vettel needs only to gain a single point in the Formula 1 standings to lock up the 2011 Drivers Championship. The second straight Formula 1 championship title for the young German driver will also be secured if closest points rival Jenson Button does not win the Japanese Grand Prix event. Running during what is expected to be a wonderful sunny day, the 2011 Japanese Grand Prix will start at 3PM in Japan (translating to 2AM Eastern time.